A veritable powerhouse, Tankor is one of the strongest of Unicron's evil generals. Unfortunately, he is also the dumbest. Has a unique partnership with his fellow Decepticon, Obsidian. Serves as the muscle in this deadly duo and will instantly flatten any enemy who choose to ignorantly cross his path. His sole purpose is to demolish everything and anything that stand's in his master's way. Served the Predacon leader-turned Cybertron despot, Megatron, before overthrowing him at the bidding of his partner, Obsidian. After being transported away to the farthest reaches of the universe to do Unicron's bidding, he was easily convinced to serve his new, more powerful master. Tankor utilizes all of his awesome weaponry to keep dissidents in line. He wields a flamethrower in tank mode, while head mounted energy lasers top off an assortment of heavy weaponry in robot mode. He heavily relies upon his partner for guidance and instruction. Separating him from Obsidian, who serves as the brain to his brawn, is the most effective way of taking advantage of his low intelligence and thus besting this formidable opponent. Prelude: Many thanks to LimeWire, who loaned me his Tankor for this review. Remarks: Like just about every toy from the original Universe toyline Tankor here is a repaint of an earlier figure, in his case Beast Machines Tankor, so look there for the full review. Just some words on the differences. 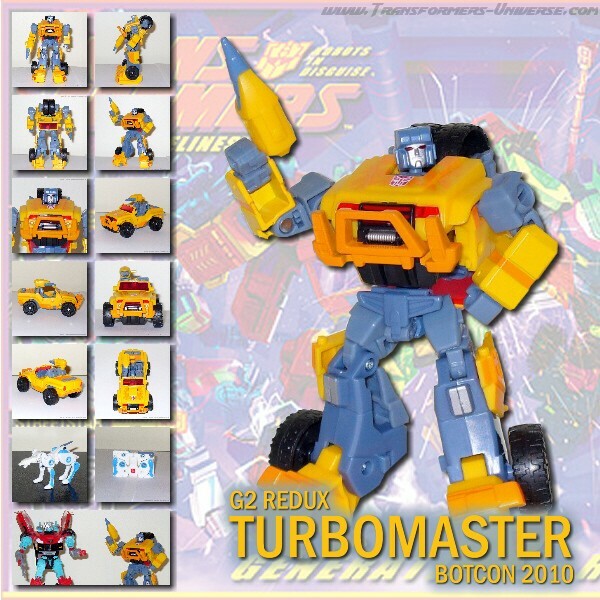 Universe Tankor is a straight repaint of BM Tankor, no changes were made to the actual mold. Universe Tankor is yellow, green, and grey whereas BM Tankor was red and grey. Instead of a Vehicon Spark Crystal Universe Tankor carries one with a Decepticon logo on it. That's it for the differences and it's really a matter of taste which version you like better. Me, I kind of prefer this one here, but just by a tad. Universe Tankor only ever appeared in the Universe comic book series from 3H Productions as one of Unicron's generals. Apparently he hailed from an alternate universe where he, along with his partner Obsidian, overthrew Megatron in the course of the Beast Machines series and took over Cybertron for themselves. The Universe comic never got a proper ending because of 3H Productions going belly-up, but one can assume that Tankor was either destroyed at some point or reverted to his previous persona of Rhinox. So the bottom line is: Tankor is a good, solid toy. Whether you get this one here or the Beast Machines version, though, is really a matter of taste.